Interested in a family-friendly daytrip to Washington’s Mt. Rainier National Park this summer or early fall? Then head 6,400 vertical feet up to Sunrise. There you and the kids can enjoy panoramic views of Mt. Rainier and the Emmons Glacier, explore interactive exhibits at the Sunrise Visitor Center, hike along scenic trails and subalpine meadows and indulge in sweet treats at the Sunrise Day Lodge. The highest point in the park accessible by vehicle, Sunrise is located on Mt. Rainier’s eastern flank about 60 miles northeast of the Nisqually Entrance. From SR 410, turn onto Sunrise/White River Rd and follow it roughly 14 miles as it zigzags up to Sunrise. Note: Mt. Rainier National Park does charge a nominal entrance fee. Usually open daily from early July to early September, the Sunrise Visitor Center offers free kid-friendly exhibits and guided Ranger walks. There’s also a small store filled with hiking maps and nature books available for purchase. 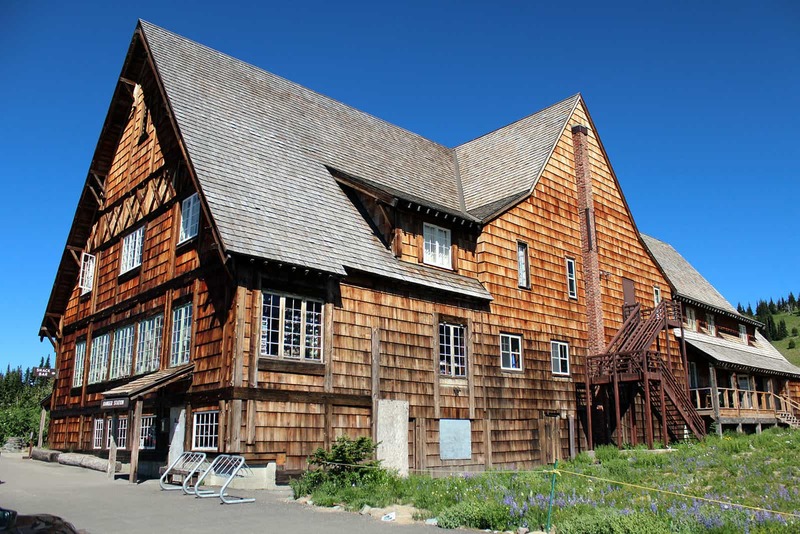 The nearby Sunrise Day Lodge, generally open the same hours as the visitor center, is home to a cute gift shop and a small cafeteria. For easy access to the visitor center and day lodge, park in Sunrise’s large upper lot. Then head to the visitor center to pick up a free Sunrise-area trail map. You should also check out the center’s white board, located near the front door. Updated daily, the board notes recommended hikes for views and wildflowers as well as any trail closures or safety concerns. Afterwards, you and the kids can explore the half-dozen interactive exhibits exploring the area’s volcanic history, geological formations, glaciers, subalpine flora and more. At the lava and glacier display, my husband Erik and I read about how the mountain’s glaciers were formed while our three-year-old son Finn happily turned the small interactive wheel. There’s also a large rock formation display that shows how hexagonal columns are created when slow moving lava meeting glacier ice. Near the center’s windows is an entire exhibit dedicated to the Emmons Glacier. Of the 25 glaciers on Mt. Rainier, the Emmons has the largest surface area at 4.3 square miles and is best viewed from Sunrise. After reading about this gigantic river of ice, peak out the nearby window to view the glacier for yourself. After exploring the center, you and the kids can fuel up for your hike on burgers, salads and cold beverages at the day lodge’s cafeteria. Or pack a picnic lunch to enjoy outside at one of Sunrise’s wooden tables. Ready to the hit the trails? For a short, guided hike try a Ranger-led interpretive walk, usually offered twice daily, weather permitting. The walks meet at the flagpole outside of the visitor center and run 45 minutes to an hour. All ages are welcome. For an easy self-guided hike, my family and I tried the 2-mile Silver Forest Trail, with an elevation gain of 150 ft. With our trail map in hand, Erik, Finn and I meandered along the wildflower-lined path, pausing often to enjoy the wide-angle views of Mt. Rainier and the Emmons Glacier. For a moderate hike with panoramic views, try the Sourdough Ridge Trail. The trailhead is located uphill from the parking lot, behind the restrooms. From there you can head west to Frozen Lake, a 3-mile hike along the ridge trail with a 500 ft. elevation gain. From the lake you can loop back to Sunrise via the Wonderland Trail and the Old Campground Trail. Or walk east along the ridge trail for a 4.2-mile hike to Dege Peak. The fourth in a series of small peaks, 7006-ft. Deke Peak is the only one with an established trail to the top. Standing on the peak’s summit, Mt. Rainier the only other thing taller for miles around, you may feel as if you’re on top of the world. Finished hiking? Then you and the kids can cool down with a frozen treat at the day lodge. Afterwards, if you’re not yet ready to call it a day, pile back into the car and head east on SR 410 for the 12-mile drive to Tipsoo Lake. The lake is easily accessible from the Tipsoo Lake picnic area, located just off the highway before Chinook Pass. Park at the picnic area or along marked sections of the highway. Tipsoo is a crystal-clear subalpine lake that sits in a meadow surrounded by Yakima Peak, Naches Peak and Mt. Rainier. Like Paradise Meadows and Sunrise, the area is filled with colorful wildflowers in late July and early August. Visitors can also enjoy a series of trails encircling the lake and Naches Peak. For an easy yet scenic walk to end the day, take the meandering 0.5-mile loop around Tipsoo Lake. There is little to no elevation gain. Families with more energy can try the moderate 4.5-mile Naches Peak Loop Trail, elevation gain 700 ft. Accessible from the picnic area, this trail starts at Tipsoo and rings around the base of Naches Peak, also offers lovely views of Mt. Rainier, wildflowers and Dewey Lake. While an exhausted Finn slumbered in his car seat, my husband and I took turns meandering along the trail encircling the lake, pausing often to admire the tranquil water and the colorful wildflowers. Then we turned west on SR 410, stopping in Enumclaw for dinner before returning home. Getting around: Go here for maps and general information on driving around Mt. Rainier. Entrance fees: Mt. Rainier National Park charges a nominal entrance fee for visitors. Click here for current rates on fees and passes around the mountain. Although there are no overnight accommodations at Sunrise, nearby Crystal Mountain Resort offers several kid-friendly lodging choices, including spacious suites at the Silver Skis Chalet and the cozy Alpine Inn. Another close option that’s great for families is the charming Alta Crystal Resort, located at the bottom of Crystal Mountain Blvd, just off SR 410. The only food service at Sunrise is at the Day Lodge, which offers a small cafeteria serving burgers, hot dogs, sandwiches, salads and soft serve ice cream. For a family-friendly dinner in Enumclaw, try artisan pizza and pasta at Jackson’s or a delightful locally sourced meal at Kelly’s Mercantile, where you’ll satisfy the kids as well as mom and dad.